This isn't actually related to the blog post, but I couldn't find another way to contact you. I'm looking at the Garter Stitch Lace pattern (Stitch ID 1350) and there is an error in the third row of the written pattern. I'm no pro knitter or anything, I just tried it and it didn't look right, which made me figure out that Row 3 has a stitch missing. My guess is it is a "k1" after the SSK, to mirror Row 9. And just because I'm curious, is Row 7 supposed to have those three purl stitches in it, but not the corresponding row, Row 1? Just curious. Like LeAnna, I couldn't find a way to contact you either. I was looking on your pattern site, & found that one pattern I was interested in did not have the instructions for it. It is the one called "Nupp Lace 1" . I'd like to get that pattern if possible. 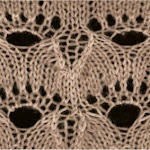 I added a text version of the Nupp Lace 1 pattern to augment the charted version. your site is the best, I love it and I thank you. Really having a tough time trying to figure out the knit the knit, purl the purl in this pattern. Please take a row and "spell" it out for me. "Knit the knit stitches and purl the purl stitches" means that you work the stitch as it presents itself on the reverse side of the work. Or in other words, when you work a wrong side of this pattern, if you see a purl stitch, you purl it; if you see a knit stitch you knit it. In the Pavillion pattern you presented, I was able to fill in the even number rows by reading the preceding row from right to left and changing the k's to p's and the p's to k's. God Bless You for that, thank you!!!!!!!!!!!!!!!!!!!!!!! ok,I had just posted a correction to Dewdrops 3. I still had not finished the pattern once and now I find a mistake in Line 7 too. it would've been very helpful if each pattern had a comment below it for such corrections just like any recipe website. But this is still good and I am not complaining. The corrections have been entered in the database. Thank you. If you can't see them immediately, you may need to refresh the screen.